Oftentimes we need to give our bikes a quick once over every other ride or so. If you frequently go for a rip in horrendous weather, it’s inevitable that you’ll need to hose it off and spend a good bit of time of time on full overhauls afterward. That said, when you’re not facing adverse conditions, it isn’t necessarily good to use water when cleaning it off every time you ride. 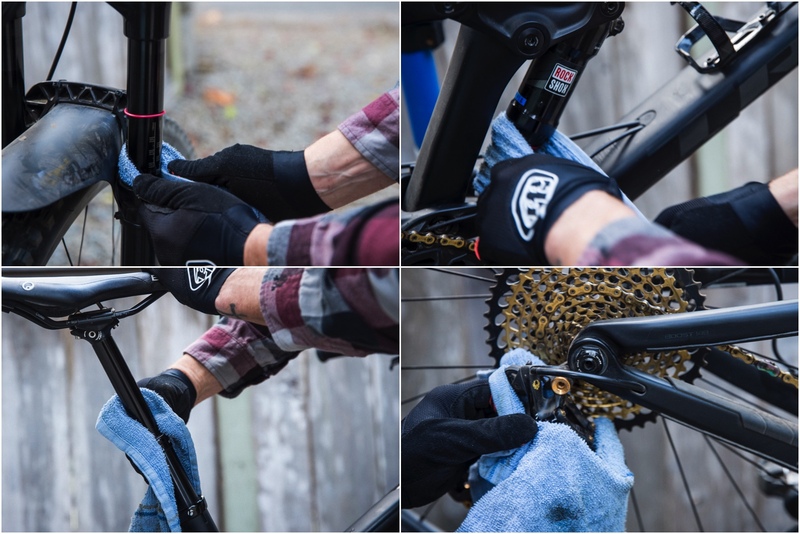 Here is a simple step-by-step to follow if you want to keep your bike feeling brand new and functioning nicely if you intend to prevent your investment from wearing out prematurely…Welcome to the 10 minute tuneup. This is all you really need. A rag, multi tool, stiff bristled brush, chain lube and some wet lube. 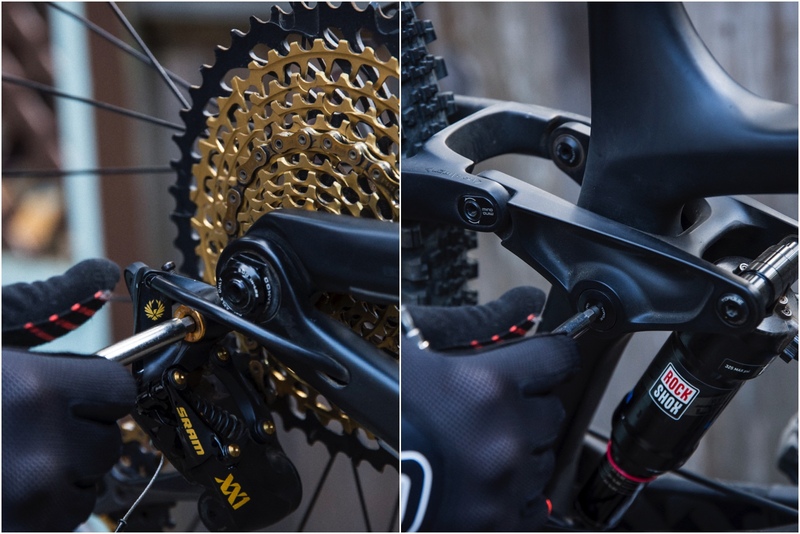 People will always argue about which chainlube is best, our tester likes Dumond Tech. That said, in our experience, Tri-Flow is the best option in terms of a wet lube. 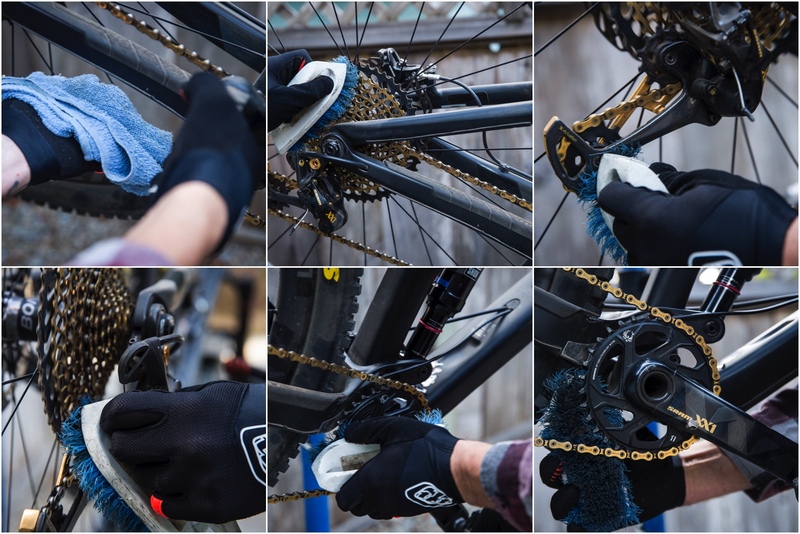 • Take a cloth rag – with the bike either propped up or in a stand, grasp the chain firmly with a rag and backpedal for a dozen or so rotations to wipe the grime off of your chain as much as possible. You can also do this with the brush as well, to really get in there. • Your cassette picks up a lot of lube and therefore said lube attracts a lot of dust and grit which builds up over time. Using a stiff bristled brush, put the chain in a gear near the middle of the range and backpedal while applying modest pressure to the cassette at the top of, as pictured above. This should help scrub off a great deal of gunk and residue from the surfaces that matter most. • Make sure to scrub off your derailleur pulleys…upper AND lower, on both the inboard AND outboard sides. • Last but not least, chainrings pick up some gunk too…especially narrow/wide style ‘rings. Whether you’re using a brush or a rag, wipe that sucker down real good. The other parts of your bike that attract grime are the sliding surfaces. The front and rear shocks, dropper ‘post and your rear derailleur also fit the bill to various degrees. • Take a rag and wipe down the stanchions on the fork, as well as the same surfaces on the shock and ‘post. Make a valiant effort to thoroughly wipe down the shaft seals on all three of the aforementioned parts. After all, this tends to be where the residue and grit builds up the most. 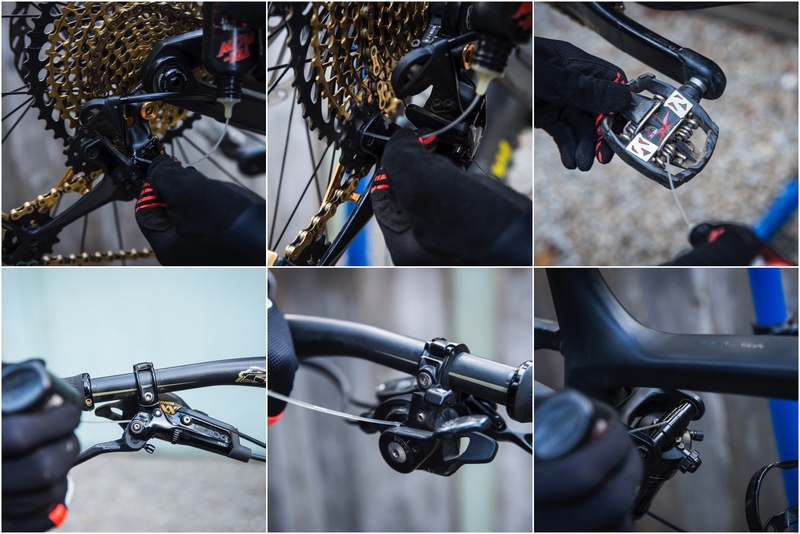 • Give the entire rear derailleur a wipe down externally, and while you’re at it – it doesn’t hurt to wipe down your shifter and dropper ‘post lever, especially near their pivots and moving parts. Once everything is all cleaned off, it’s time to re-lube the seals and moving parts. As you can see above, we’ll start from top left. • Carefully using wet lube and a straw, hit each of the 8 pivots on the two parallel plates on the derailleur body. **Also, make sure you hit the main pivot that the derailleur cage rotates on. • Put a dab of lube in the derailleur pulleys right at their seals. Make sure to do this inboard and outboard. • It doesn’t hurt to put a drop or two on your clipless pedals’ springs. If you run clipless pedals, keeping the springs and cleats from getting too dry and dusty can prevent annoying noises and creaking. • Dab the pivots and moving parts on your brake levers and shifter(s). • On your frame, it doesn’t hurt to conservatively lube on the pivots now and again. Shock bushings are especially prone to making noise. A dab of wet lube here and there can go a long ways. 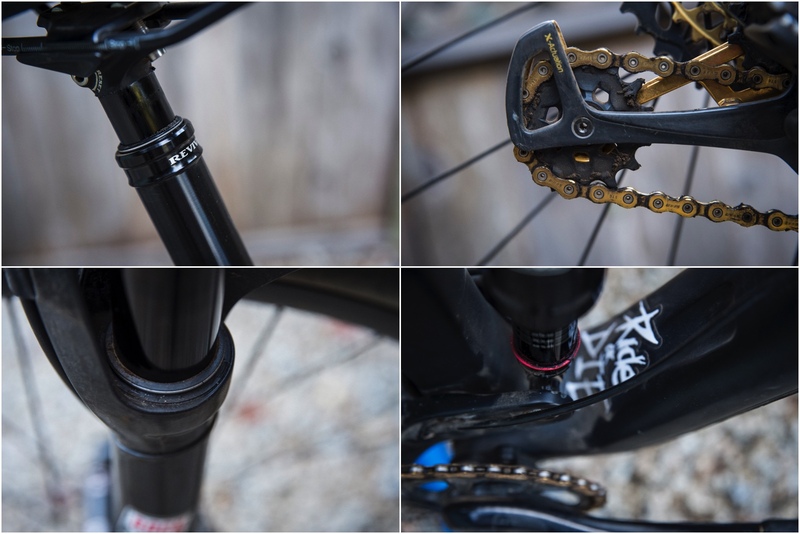 Up next, you want to keep your suspension and dropper post moving freely. Be careful which lube you use. You definitely don’t want to use a dry or paraffin lube here as it will just gum things up. Tri-Flow doesn’t degrade seals or O-rings, so it makes the most sense to use in this application, but use your best judgement. 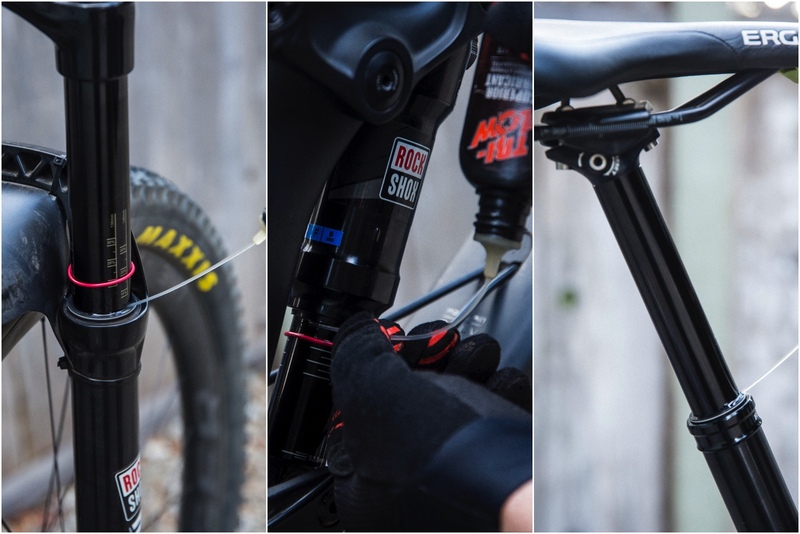 • Hit each seal with a drop or two of wet lube and cycle your suspension and/or dropper post. 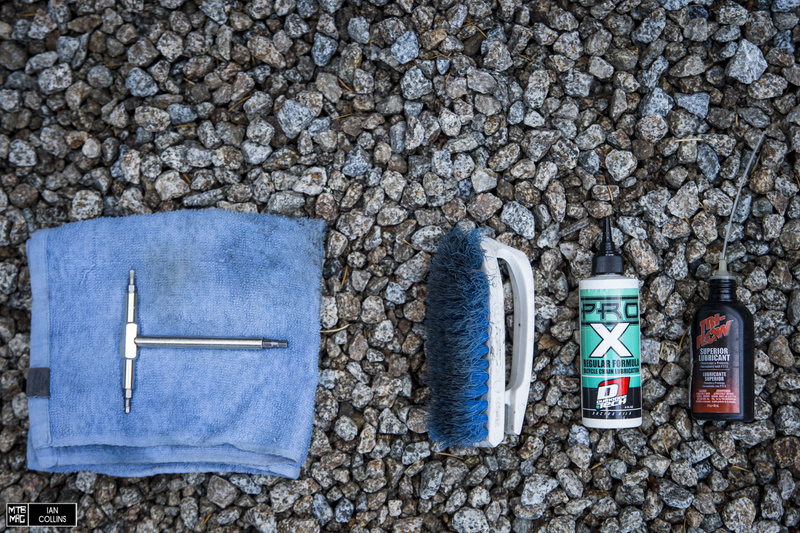 **Make sure you don’t apply the lube excessively and after cycling, use a rag to wipe off any and all excess lube. Last but not least, give all of your hardware a solid once over. Whether you have a torque wrench handy or not, if you’re pinched for time – it’s always wise to touch a wrench to each critical piece of hardware and make sure nothing is drastically loose.